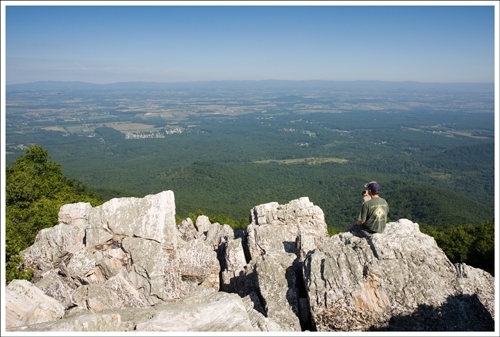 The hiking landscape of Shenandoah National Park (SNP) is dominated by the Appalachian Trail. Like a backbone extending down the Blue Ridge, the AT runs the length of the park and attracts large numbers of day hikers and weekend overnighters, in addition to the annual thru-hiker migration. But SNP offers a lot more to the adventurous hiker than just white blazes. 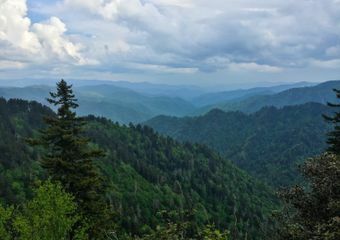 A large number of trails branch off from the AT to the east and west, offering plenty of scenic terrain and some excellent opportunities to explore the backcountry. SNP is pierced twice by east/west highways that divide it into three parts: the Southern, Central, and Northern Districts. 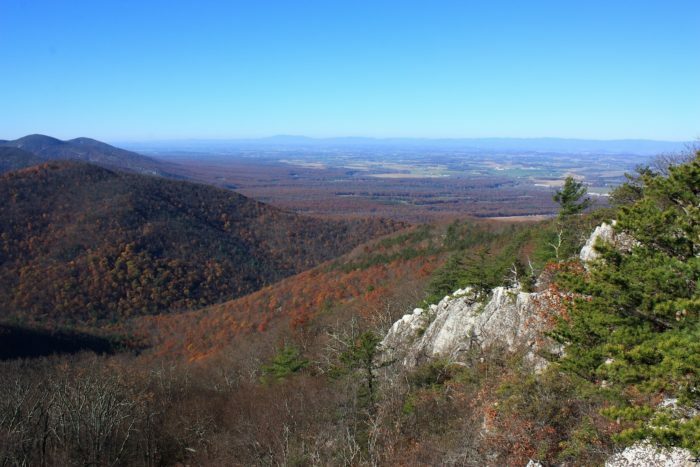 The Southern District features waterfalls, swimming holes, and rock outcroppings with outstanding views of the Shenandoah Valley and the mountains of the Blue Ridge. 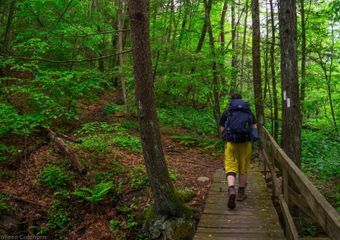 Grab your pack and let’s explore Shenandoah. 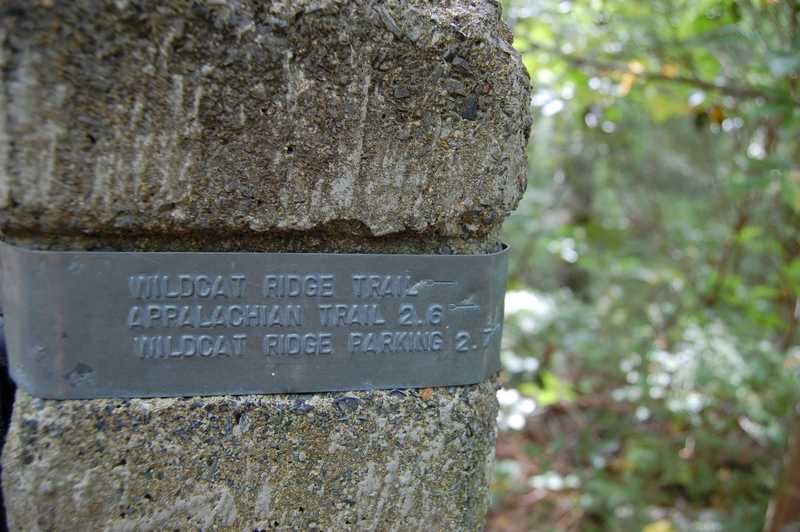 Get there: Park your car at the Riprap Parking area at milepost 90 on Skyline Drive. A quick navigation note: Skyline Drive is marked by mileposts, with MP 0 at the north end. The closest entry point for this hike is near I-64 at the Rockfish Gap Entrance Station. Enter and continue north to the parking area. Check the SNP website for current user fees. 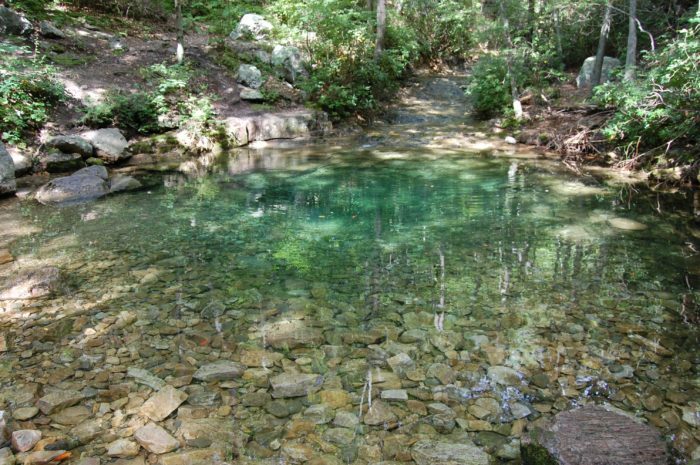 This hike is a favorite for day hikers and trail runners, with a great combination of views, a lovely set of cascades, and a small but sweet swimming hole. From the parking area, head north .4 miles and then turn left onto the Riprap Trail. Riprap Trail descends, with excellent views from Calvary Rocks and Chimney Rock, and then follows a tumbling stream that you’ll cross several times. Watch for the swimming hole after a small waterfall. If you’re looking for a short overnight trip there are plenty of excellent camping sites along the stream. 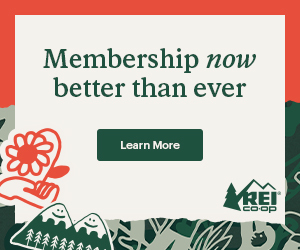 Get a free permit at the entrance station if you’re planning on camping in the backcountry. After the swimming hole look for the intersection with the Wildcat Ridge Trail and turn left. The trail ascends, crossing a stream several times as you climb steadily back up towards Skyline Drive on a well-graded trail. When you reach the AT, turn left and hike 2.7 miles back to the parking area. The swimming hole and stream crossings make this a delightful summer hike. Be sure to carry enough water for the ascent up Wildcat Ridge. It’s about 1300 feet and the western exposure can make for a hot climb. Get there: Park at the Jones Run Parking Area at MP 84 on Skyline Drive. The parking area is just about equidistant from the Rockfish Gap Entrance station to the south and the Swift Run Gap Entrance Station to the north. This is an excellent hike for waterfalls, with some of the nicest you’ll find in the Southern District. From the parking area follow the Jones Run Trail, descending along Jones Run and passing a nearly 50-foot cascade and then a series of smaller ones as the trail becomes steeper towards the bottom. You’ll note some excellent camping spots near the bottom, perfect for a night in the backcountry. At the junction with the Doyles River Trail, you’ll bear left and start back up the mountain. The trail can be steep and rocky at times, so take your time and enjoy the views, including a pair of nice falls, with the lower falls measuring over 60 feet. Along the way, you’ll observe some large stands of hemlocks, highly stressed by wooly adelgid infestations, and mostly dead now. After the falls, continue uphill on the Doyles River Trail until you reach the Appalachian Trail. Turn left (south) and white blaze it back to the parking area. 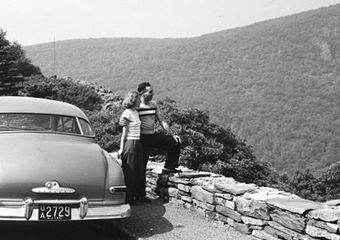 Get there: Park your car at the Sawmill Run Overlook, between MP 95 and 96. The parking area is best accessed from the Rockfish Gap Entrance Station, about 10 miles to the south. 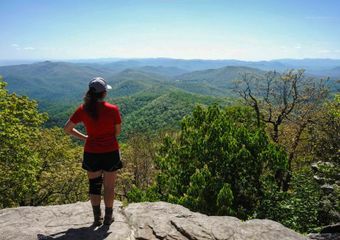 This is a short hike that rewards you with great views from a rock summit and an excellent example of one of the many exposed rock talus fields that are common through this portion of the Blue Ridge Mountains. The hiking is generally easy throughout, with a bit of a rock scramble towards the summit of Turk Mountain. It’s well worth the bit of effort required to enjoy the view from the top. 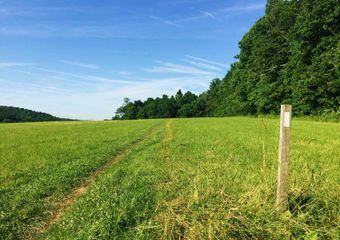 Start your hike by heading north on the AT from the parking area. 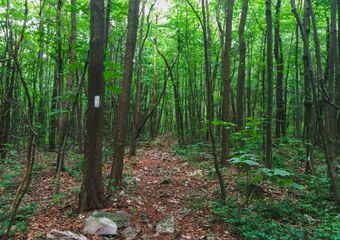 The trail rises gently through some open forest until you reach the Turk Mountain Trail. Turn left onto the trail, descending somewhat steeply for a while until you reach a saddle between the ridge you’ve just left and the slopes of Turk Mountain. The trail then ascends to a rocky patch near the summit. Take a few minutes when you reach the exposed rock peak to enjoy the view and grab a selfie. Expect company if it’s a weekend – this is a popular day hike. Get there: Park at the Two-Mile Run Overlook parking area (MP 76) and walk north a short distance to the Rocky Mount Trail trailhead on the west side of Skyline Drive. The parking area is best accessed from the Swift Run Gap Entrance Station, about 10 miles to the north. I’ve observed Rocky Mount, standing out prominently from the surrounding hills, many times while cycling on Skyline Drive. Getting to it is harder—it’s a tough hike through one of the more remote and less traveled portions of the park. The trail descends from Skyline Drive, climbs a secondary peak, and then ascends to the summit of Rocky Mount. Be sure to enjoy the view from the cliffs just before the summit. The descent from the summit is steep and rocky, so watch your footing. After the trail levels a bit, you’ll cross Gap Run and then pick up the Gap Run Trail branching to the right. Be sure to follow the blue blazes marking the trail as it follows and then leaves an old roadbed. The Gap Run Trail eventually intersects with the Rocky Mount Trail to complete the loop. Bear left and return to Skyline Drive on the Rocky Mount Trail. This is a great “get away from it all” trail, and is particularly interesting since a large wildfire burned much of this area in 2016. The forest has recovered rapidly but presents an interesting example of how the natural ecosystem bounces back from events like this. Thanks for the hike suggestions and descriptions. Have a question about the Riprap/Wildcat hike you describe. That full loop is 9.8 miles rather than 3 miles. If you just go out to Calvary/Chimney Rocks it’s a 3 mile out and back (a great, easy hike). Want to make sure people are prepared when they set out on this hike. It is a great one!